Jointace Rose Hip & MSM provides MSM (Methylsulfonylmethane) which is a naturally occurring organic compound, plus standardised Rose Hip extract (Rosa Canina), containing a complex mixture including proanthocyanidins and flavonoids. Copper contributes to the maintenance of normal connective tissues and therefore can be beneficial to cartilage (as cartilage is made up of connective tissues). Vitamin D3, zinc and manganese all help to maintain normal bone. Vitamin D3 is provided in its Cholecalciferol form as naturally produced by the body on exposure to sunlight. Two Jointace® tablets per day with your main meal. Swallow with a full glass of water or a cold drink. Not to be chewed. Glucosamine Sulphate (as Potassium Chloride) USP†Methyl Sulphonyl Methane Tablet Disintegrant: Potato Starch, Polyvinylpolypyrrolidone Tablet Binder: Polyvinylpyrrolidone, Chondroitin Sulphate Sodium USP†, Rose Hip ExtractBulking Agents: Dibasic Calcium Phosphate, Microcrystalline CelluloseTablet Coating: Hydroxpropylmethylcellulose & Natural Source Colours (Titanium Dioxide & Iron Oxide) Zinc Sulphate Lubricants: Silicon Dioxide Magnesium Silicate, Magnesium Stearate, Manganese Sulphate, Vitamin B12 (as Cyanoccbalamin Prep. )Ginger Root Extract Copper SulphateVitamin D3 (as Cholecalciferol Prep. )Folacin (Folic Acid) Sodium Selenite†USP = United States Pharmacopeia. No artificial colours, gluten, preservatives, sugar, salt, yeast. Do not take if you are allergic to shellfish. Diabetics should consult their doctor before using this product. Do not exceed the recommended intake. 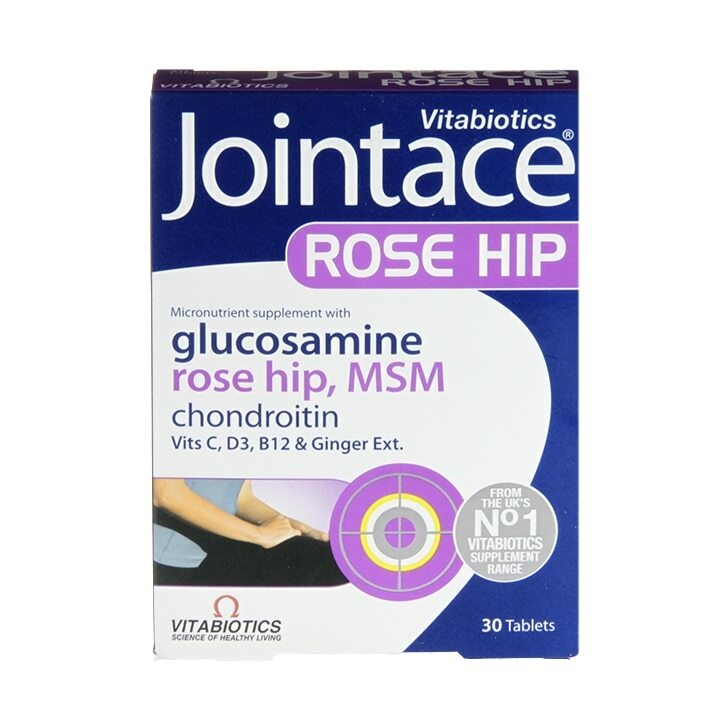 Vitabiotics Jointace MSM & Rosehip Tablets is rated 3.3 out of 5 by 4. Rated 1 out of 5 by liz43 from not recommended been taking this for over 2 weeks now and pain has not improved. won't buy this again. Rated 4 out of 5 by mishacat2 from Only just started taking these so don't know yet how they will work. After one month I should have abetter idea but I am happy to give them a go.